More than 700 people have been arrested in the weekly “Moral Monday” protests in North Carolina. For the past two months, activists in North Carolina have been protesting a bill that could limit abortion access, and more than 700 people have been arrested in the weekly “Moral Monday” protests against the state’s first Republican-led government in more than a century. 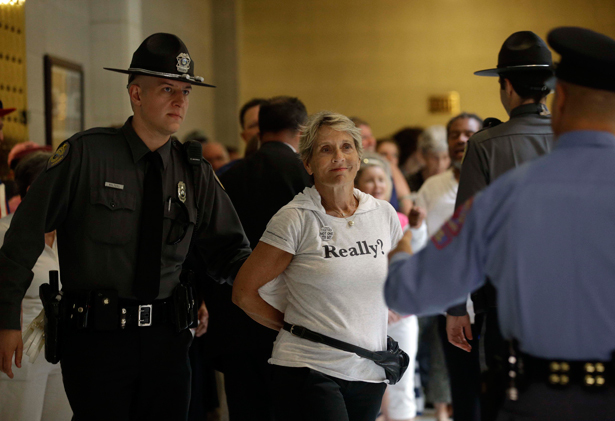 This Monday, 2,000 people flooded the state capitol in Raleigh, and sixty-four protesters were arrested after refusing to leave the legislative chambers. Those arrested included Janet Colm, president and CEO of Planned Parenthood of Central North Carolina. The bill passed last week by the State Senate required abortion clinics to conform to the same safety standards as ambulatory survey centers, a requirement currently met by only one of the state’s clinics. Opponents say this will limit access to safe abortions. Moral Monday participants come from all backgrounds and walks of life. Megan Katsaounis was born and raised in North Carolina, and while she’s always been highly critical of mainstream Democratic officials, she’s grown concerned watching “horrible bills” pass through the Republican-controlled Senate. “Every week, there’s something new to be outraged about. They repealed the Racial Justice Act. We’re now the first state to be disqualified from receiving federal funds for the long-term unemployed. The list of grievances goes on and on,” she said. Katsaounis wanted to participate in Moral Monday since she first heard about the protests, but as a mom, “childcare is always a hurdle.” Finally, when the infamous anti–Sharia Law omni-bill was being debated in the senate, Katsaounis got so angry she skipped work to go witness it. Last week, North Carolina lawmakers voted to add a series of sweeping anti-abortion regulations to a measure to ban the “application of foreign law” in family courts, an “anti-Sharia Law” bill that many opponents say is a thinly veiled attempt at stoking anti-Muslim sentiment in the state. “I wish I was in a position to be arrested. A lot of us are angry at the direction our state is going and we’re feeling very helpless right now. Being hauled away in handcuffs seems like a very tangible way of taking a stand, and I love how volunteers support the arrestees, providing meals for everyone upon release. It’s inspiring,” she added. Amy McKee joined the protests for the first time on Monday. The last time Rev. Frederick Battle was arrested was in 1962’s historic Woolworth’s department store sit-in in Greensboro, a pivotal moment in the US civil rights movement. He was among those arrested on Monday. “What scares me about today is that I see similarities that we are going back to those days, back to the ’60’s,” Battle told WRAL. Self-proclaimed “soccer mom” Christine Lang also joined the protests. Rev. William Barber II, head of the state branch of the NAACP, leads the Moral Monday protests. GOP-controlled state legislatures have attempted to depict concerned citizens as unruly mobs in need of arrest and jailing. In Texas, Lieutenant Governor David Dewhurst warned that protesters who caused a disruption in the gallery while lawmakers considered that state’s abortion bill would be removed and may face forty-eight hours in prison. Observers in North Carolina say some of those handcuffed and charged with misdemeanours in recent weeks were simply exercising their First Amendment rights. House Democratic Leader Larry Hall said last week that many were handcuffed for “petty citations” and shouldn’t have been sent to jail. Squashing democratic dissent is in keeping with lawmakers’ recent behavior. For example, the State Senate quickly voted on Tuesday night to pass a package of anti-abortion amendments attached to a bill that would ban Sharia law even though Republican Governor Pat McCrory had raised concerns that the Senate had unfairly rushed the amendments through. All of this raises the question: What’s the point of living in a democracy with a First Amendment if lawmakers are going to sneak legislation through in the middle of the night and have concerned citizens arrested when they try to object?